Because of political trouble back home in Canada, PM Stephen Harper received an exclusive invitation to last year's D-Day commemoration in France, according to documents posted by WikiLeaks recently containing secret U.S. diplomatic records. According to the U.S. embassy in France, both Harper and British PM Gordon Brown received the invitations because each "were in such political trouble at home" said the dispatch, and "the survival of their governments was at stake," continued the cable to Washington. In 2008, Harper and his Conservative Party faced the possibility of the opposition parties tossing his party out of power during the economic troubles facing the country. 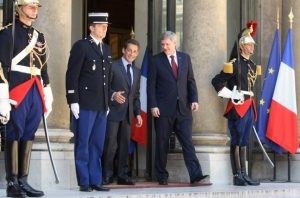 The leaks show Sarkozy took pity on his Canadian counterpart and extended an invitation to the ceremony. German leaders were not invited to the ceremonies, says a key French Presidential advisor Jean-Levitte, as the invitation would force they be extended to eastern European countries. The British and Canadians were singled out because of their political troubles at home, according to the cable. The disclosures by Wikileaks are currently ongoing. Reports released by Wikileaks also include U.S. concern with Canada's view on Americans such as those displayed in the CBC drama 'The Border.' That report focused mainly on the CBC.